The governor's comments come after Cumberland County Sheriff Kevin Joyce says it is unconstitutional to hold prisoners beyond their release dates without a warrant. Gov. Paul LePage said Monday that he plans to remove from office any sheriff who refuses to cooperate with U.S. Immigration and Customs Enforcement agents when they ask for prisoners to be held beyond their scheduled release dates. 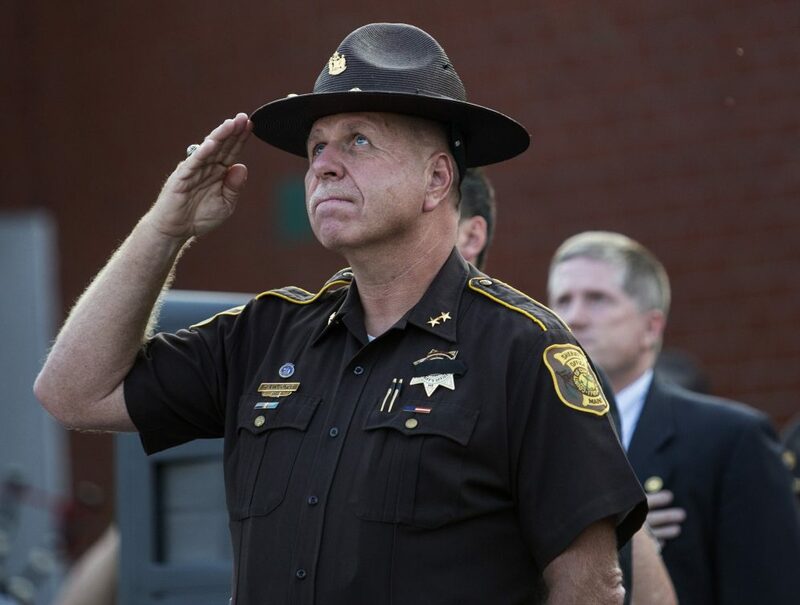 But one of those sheriffs, Cumberland County’s Kevin Joyce, said Monday that he will continue to do what he believes is his constitutional duty. LePage did not identify any sheriffs by name, but the threat appears aimed primarily at Joyce, who said last week that he will no longer hold prisoners at the county jail past their release dates at ICE’s request. The federal agency sometimes asks that prisoners be held longer based on a suspicion that they violated immigrations laws. LePage told Ingraham that a second sheriff has been “sending signs” that he might no longer cooperate with ICE. It was not clear who the second sheriff is, but LePage said he would seek to remove him, too, if he doesn’t cooperate with ICE. The state constitution gives governors the power to remove sheriffs if they are failing to uphold the law, but LePage hasn’t started the process with Joyce, the governor’s office said Monday. The constitutional provision calls for sheriffs to be given “due notice” and makes a reference to a hearing, although it does not provide a specific procedure for removal from office. Joyce said Monday that he is simply upholding the law and following recent court orders concerning “detainers” from ICE. He said such detainers are requests, but not official orders, by the immigration agency to hold people beyond their release date who may have violated immigration laws. Joyce said he will continue to hold suspects arrested by ICE and would hold inmates beyond their release date if ICE has warrants for their arrest. But, Joyce said, court rulings indicate that sheriff’s offices should not be holding people beyond their release date at the request of ICE and should detain people only in cases where there is probable cause that someone has violated the law or in cases where the requesting agency has an arrest warrant. “If you think you’ve got something, get a warrant. We’ll honor the warrant,” Joyce said in announcing his new policy. Joyce said he discussed the situation Monday with a county attorney and does not dispute the governor’s power to remove him from office if he does not do his job. The next move is up to LePage, Joyce said. It was not clear what “due notice and hearing” would entail. Monday afternoon, LePage spokeswoman Julie Rabinowitz cited that provision of the state constitution and a law that says sheriffs need to “obey all orders relating to law enforcement which they receive from the governor.” She also said that an executive order that LePage signed in 2011 requires state employees and officials to cooperate with federal officials “on all matters pertinent to immigration” except where limited by state law or the U.S. or Maine constitutions. She did not respond when asked by email if county sheriffs are considered state employees or state officials. County sheriffs are elected by voters in their counties and are effectively paid by the taxpayers in their counties. Joyce said ICE gets daily email updates from his office about those who are housed at the county jail. He said most of those arrested and held at the jail are there for low-level, non-violent offenses, such as operating a motor vehicle without a license or operating under the influence. Joyce said most of the people held overnight are there only until they can arrange for bail. In the past, ICE would ask the county to continue to hold some people who agents believe may have violated immigration laws. However, Joyce said, court rulings suggest that holding people based only on the request of other law enforcement agencies is unconstitutional. “This is not anti-ICE, this is protecting Cumberland County taxpayers from exorbitant costs if one of these individuals sues us and the case goes bad,” Joyce said. State records on removal of sheriffs from office are a bit spotty. But in the past, it appears a governor has removed a sheriff only after the Legislature requested it, according to records compiled by the Legislature’s Law Library. In 1913, a Cumberland County sheriff was removed from office for failing to enforce a statewide prohibition against the sale and possession of alcohol. The Legislature had passed a resolution calling on the governor to remove him. The Androscoggin County sheriff resigned in April 1913 before the Legislature could act on a resolution asking the governor to remove him, but the records don’t indicate what he was accused of doing that may have warranted his removal. And that same year, the Legislature adjourned before taking action on a resolution to remove from office the Knox County sheriff, who had been quarantined for smallpox. The Law Library records don’t contain any information on his fate. In 1951, the Governor’s Council considered removing Philip M. Dearborn, the Cumberland County sheriff. Although the accusations against Dearborn are unclear from the records in the Law Library, the council voted unanimously not to seek his removal from office.